In a meeting with an Iranian delegation in the Vatican City, Pope Francis, the leader of world’s Catholics, praised the Iranian culture. Head of Iran’s Islamic Culture and Relations Organization Abuzar Ebrahimi Torkaman travelled to the Vatican City at the head of a delegation of Iranian thinkers and scholars earlier this week to take part in the 10th round of Iran-Vatican Interfaith Dialogue. 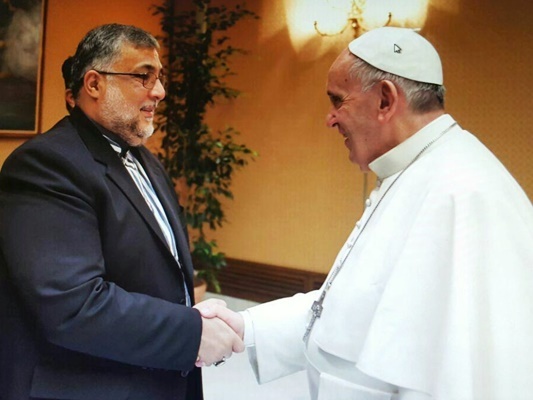 On Wednesday, Ebrahimi Torkaman met with Pope Francis at the Vatican, Tasnim reported. During the meeting, the Pontiff appreciated the Iranian delegation’s visit to the Holy See and taking part in the “important interreligious dialogue”. During the meeting, President of the Pontifical Council for Interreligious Dialogue Cardinal Jean-Louis Tauran presented a report on the 10th round of Iran-Vatican Interfaith Dialogue, which was co-chaired by himself and Ebrahimi Torkaman. In their final statement at the end of the two-day event on Wednesday, the participants condemned acts of violence committed in the name of religion. In a meeting between Iranian President Hassan Rouhani and Pope Francis at the Vatican in January, Rouhani and the Pope underlined that divine religions can promote peace and end violence and extremism. They called on world nations to make comprehensive efforts to establish global peace. The two sides also urged countries and international organizations to help ease human suffering and swiftly stop war and clashes.